Dame Kathleen Lonsdale, (28 January 1903 – 1 April 1971) was an Irish crystallographer who proved that the benzene ring was flat by X-ray diffraction methods in 1929. She was the first to use Fourier spectral methods while solving the structure of hexachlorobenzene in 1931. During her career she attained several firsts for a woman scientist, including one of the first two women elected a Fellow of the Royal Society (FRS) in 1945 (along with Marjory Stephenson), first woman tenured professor at University College London, first woman president of the International Union of Crystallography, and first woman president of the British Association for the Advancement of Science. She was born Kathleen Yardley at Newbridge, County Kildare, Ireland, the tenth child of Harry Yardley, the town postmaster, and Jessie Cameron. Her family moved to Seven Kings, Essex, England, when she was five years old, her mother decided to relocate the family as a result of Harry’s alcoholism. 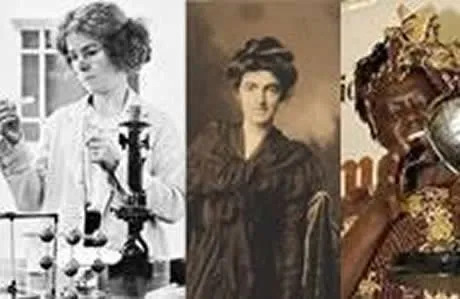 She earned her Bachelor of Science degree from Bedford College for Women in 1922, graduating in physics with an MSc from University College London in 1924. In 1924, she joined the crystallography research team headed by William Henry Bragg at the Royal Institution. In 1927 Yardley married Thomas Jackson Lonsdale and had three children. In addition to discovering the structure of benzene and hexachlorobenzene, Lonsdale worked on the synthesis of diamonds. She was a pioneer in the use of X-rays to study crystals. In 1949, Lonsdale became a professor of chemistry and the head of the Department of Crystallography at University College, London. Lonsdale died on 1 April 1971 from an anaplastic cancer of unknown origin. Sophonisba Preston Breckinridge (April 1, 1866 – July 30, 1948) was an American activist, Progressive Era social reformer, social scientist and innovator in higher education. Sophonisba Preston Breckinridge was born in Lexington, Kentucky. She was the daughter of Issa Desha Breckinridge who was the second wife of Col. William C.P. Breckinridge, a member of Congress from Kentucky, editor and a lawyer. Her grandfather was the abolitionist minister Robert Jefferson Breckinridge. She graduated from Wellesley College in 1888 and worked as a school teacher in Washington, DC teaching mathematics, before returning to Lexington to study law in her father’s office. In 1895, she became the first woman to be admitted to the Kentucky bar. In 1907 she moved into the Hull House and began in earnest to work with the first leaders in the Chicago settlement house movement on issues such as vocational training, housing, juvenile delinquency and truancy. Breckinridge was a co-founder of the Chicago School of Civics and Philanthropy, becoming its first (and only) dean. By 1920, Breckinridge and her colleague, Julia Lathrop had convinced the Board to merge the School into the University of Chicago, forming the Graduate School of Social Service Administration. By 1927 the faculty of this new academic unit created the scholarly journal Social Service Review which remains the premier journal in the field of social work. Breckinridge was one of the founding editors and worked on its publication every year until her death in 1948. By 1909 she had become an assistant professor of social economy, and over ten years later (1920) she finally convinced her male colleagues of her research abilities and earned tenure as associate professor at the University of Chicago. She earned full professorship in 1925, and in 1929 she served as the dean of pre-professional social service students and professor of public welfare administration until her retirement from the faculty in 1933. She was awarded honorary degrees by Oberlin College in 1919, University of Kentucky in 1925, Tulane University in 1939, and University of Louisville in 1940. As a resident of Hull House until 1920, she became active in several causes, including women’s suffrage, African-American civil rights (she helped establish the NAACP), labor, immigration, children’s protection and labor laws reform. Breckinridge was the first woman U.S. representative to a high-level international conference, the 1933 Montevideo Conference. In Chicago, on July 30, 1948, Sophonisba Breckinridge died from a perforated ulcer and arteriosclerosis, aged 82. In the 1970s, Maathai founded the Green Belt Movement, an environmental non-governmental organization focused on the planting of trees, environmental conservation, and women’s rights. In 1984, she was awarded the Right Livelihood Award, and in 2004, she became the first African woman, and the first environmentalist, to receive the Nobel Peace Prize for “her contribution to sustainable development, democracy and peace”. In a statement announcing her as the 2004 Nobel Peace Prize winner, the Norwegian Nobel Committee said: Maathai stood up courageously against the former oppressive regime in Kenya. Her unique forms of action have contributed to drawing attention to political oppression—nationally and internationally. She has served as inspiration for many in the fight for democratic rights and has especially encouraged women to better their situation. Maathai was an elected Member of Parliament and served as assistant minister for Environment and Natural Resources in the government of President Mwai Kibaki between January 2003 and November 2005. She was an Honorary Councilor of the World Future Council. She founded the Mazingira Green Party of Kenya in 2003 to allow candidates to run on a platform of conservation as embodied by the Green Belt Movement. In 2011, Maathai died of complications from ovarian cancer after a life full of struggle, arrests and exile for human and women’s rights as well as for protection of the environment. In 2012, the Collaborative Partnership on Forests CPF, an international consortium of 14 organizations, secretariats and institutions working on international forest issues, launched the inaugural USD20,000 Wangari Maathai Award to honour and commemorate an extraordinary woman who championed forest issues around the world.